The Euro Hostel Helsinki sits right next to the Katajanokka sea terminal area and is just a short walk from the many shops, sights, and restaurants of downtown Helsinki. The Helsinki Zoo Korkeasarri can be reached by ferry, and the stop for that is only a few hundred meters from this Helsinki accommodation. Numerous forms of public transportation are easily accessible for guests staying in the Eurohostel Finland. A total of 135 rooms are distributed across 5 floors in the Eurohostel Hotel Helsinki. Guests may choose to stay in a single, twin, or tripe room. Each room comes with a table and chair, and at least one lockable wardrobe. 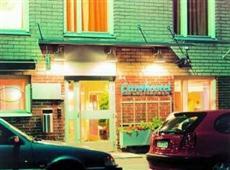 The Eurohostel in Helsinki is ideal for budget-conscious travelers, as guests only pay for the services they need. Each of the hotel’s 5 floors has its own self-catering facilities with hot plates, microwaves, a lockable refrigerator, and satellite TV. Breakfast and a variety of other delicious meals can be enjoyed throughout the day in the property’s on-site restaurant. Guests looking for a way to relax can head to the top floor, where the saunas are located.